Recent villa located in Jimbaran, 1 km from Jimbaran beach and only 500 m from the Four Seasons hotel. The villa on two levels has 3 spacious bedrooms. the Villa was completely renovated in 2010 in a modern Balinese style. Large living room. The villa also has 3 bathrooms. Upstairs, mezzanine with office if you need to work. The swimming pool of 10m x 3.5m is in a pleasant tropical garden. A BBQ is available. 3 bathrooms (with large shower). Two of them are on the first floor and the third is on the ground floor. The bathroom linen is provided. Each bathroom is equipped with fitted units. Table in the dining area to accommodate 8 people. A BBQ is available for a wonderful evening at the pool. Nice villa in a good location high above Jimbaran Bay on a busy road across from a small convenience grocery mart. The owner arranged a chef for us (he charged extra (with groceries it came to about $60 US for one meal for 4 people). The beds and bed linens were comfortable. Staff were very pleasant. We are glad you have enjoyed our villa and services provided by the housekeeper and the chef. We look forward to serve you again another time! Nice villa and nice pool in the hearth of Jimbaran, taxis are around the corner and housekeeper will assist you for any need. Cleanness is overall the best factor but also the taste for furniture and a nice garden bring my rating so high. A must go if you need a relaxing week in Bali far away from the mess of Kuta or Seminiak. Thank you so much for your complimentary words. We are glad you have enjoyed our villa and its design, the tropical garden and the swimming pool. Yes, Jimbaran is more quiet. And the beach is within walking distance from the villa. We hope we will have the pleasure welcoming you again in the future. And Kadek (the housekeeper) will surely be happy to look after you again! We stayed for two weeks at this lovely home in Jimbaran, and at every step we were impressed with the high level of service and amenities. We are a family of 4 with two small children, and my mother joined us for the second week. We had more than enough room, with three good sized bedrooms and three baths (note that the baths all have showers but not tubs, which could be tricky for some kids/babies, but we certainly made do). The kitchen is compact but well-stocked. From our first email with Emmanuel, he did everything possible to accommodate our requests and help with problems. He arranged for a fantastic chef to come in and cook a full Indonesian meal for us, helped with drivers and car arrangements, and of course, ensured Kadek was taking excellent care of us. We've used VRBO for rentals in various countries about 15 times now, and this was not only value for our money but one of the nicest homes we've ever stayed in. A few notes for people considering renting this home with young children - there are steps to get into the pool, which I appreciated as a safety feature: they can't fall in. The yard is large and good for running around. Kadek very kindly provided some small toys for our kids to play with. The house is well suited for having kids stay there. Emmanuel even arranged for a crib for our 10 month old, which was ideal. The road (outside the high gate) is busy but you don't hear too much from the yard. We loved our time in Bali, and a big part of that was due to Emmanuel and Kadek, and how well they took care of us. I cannot recommend this house rental enough! Thank you very much for taking some time to write a note to share your experience at our villa in Jimbaran, Bali. We are glad you enjoyed your stay in Bali and liked the villa comfort and design. We wanted this villa to keep its original Balinese feel, and gave it a modern touch, in the interior and design. Will share your feed back with Kadek, our housekeeper and I am sure your comments will be a real motivation for him. We thank you for visiting us and hope to have the pleasure to welcoming you once more in the future. New, clean and modern villa with spacious rooms practically located near Jimbaran beach, Uluwatu etc. Great for a large family or a group - we were three generations there and had a comfortable stay for a reasonable price. Delicate pool, towels and bed linen. Nice garden. Small convenience store just a few steps from the property and walking distance to high end hotels. We appreciated the prompt and friendly online communication with the owner and not the least the smiling and pleasant house keeper at site. Thank you very much for your kind words about your stay and experience at our villa. It is good to see you and your family have enjoyed the comfort of the villa, the swimming pool and the service of the house keeper. Bali has so much to offer! Modern, clean, comfortable villa in the heart of Jimbaran! One of the most memorable trips I have ever been on! My family flew from various parts of the world for a family reunion/wedding in Bali. After spending endless nights researching Jimbaran, I came across this beautiful villa. I was looking for something that was reasonably priced, close to shopping centers as well as accessible for sightseeing. From the first email exchange with Emmanuel, I knew this was the place I wanted to stay at. He was extremely pleasant, prompt in responding and provided everything I requested. Upon arrival, we were greeted by Kadet, the nicest housekeeper I have ever met. Kadet greeted us as if we were royalty and was available during our complete stay. Every morning he would make our room, clean the whole house (indoor and outdoor) and attend to any chores we had. He made our stay very comfortable! The villa itself is very beautiful. It is well-maintained and has a lot of character. There were 6 of us staying at the villa and it was very comfortable. There is a taxi stand about 10 feet down the street and is easily accessible to all the nearby towns. I would highly recommend this villa and we all look forward to coming back to Bali and staying here! La villa est très agréable à vivre, avec de beaux espace et une décoration moderne. Les salles de douches sont très propres. La cuisine est moderne et très bien équipée. Les chambres sont bien décorées, très propres mais 2 climatisations sur 3 peinent un peu. Elles parviennent qd même à rafraîchir. Kadek, jeune homme de 24 ans s'occupe du ménage et de l'entretien de la propriété. Il vit sur place, dans une partie séparée de la villa et est très serviable et discret. Il est très heureux de nous donner des conseils sur les visites, plages et aussi pour expliquer la culture indonésienne et la religion hindouiste. Il peut trouver des fruits et s'occuper de les préparer. Merci beaucoup d'avoir pris le temps de partager avec d"autres vacanciers, votre experience dans notre villa a Jimbaran, Bali. Nous sommes ravis de savoir que vous avez passé un agreable sejour a Bali et que vous avez apprecie le confort de la villa et des attentions de Kadek. Nous esperons avoir l'occasion de vous recevoir a nouveau une autre fois! 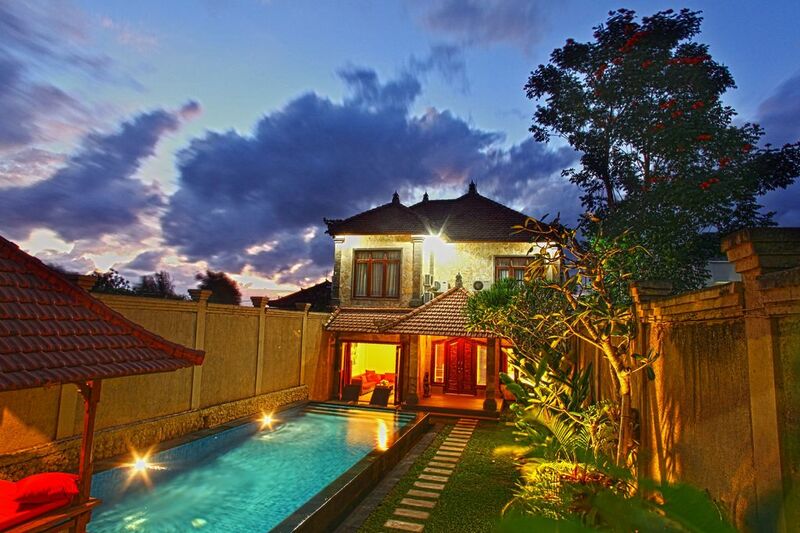 The villa is located 12 minutes from the international airport in the south of Bali. 15 minutes from Kuta and its shops, cafes and restaurants. Contactez nous directement pour longs sejours. Tarifs adaptes.